Clearance! As low as .99! 5th Gen iPod nano Thumbs Up! iPod touch (2G/3G) Thumbs Up! Charge your iPod or listen to music while your skin stays on. 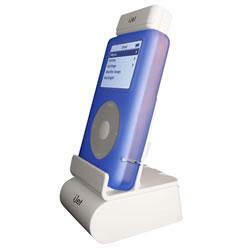 The iJet Stand for iPods is designed to serve as an alternate solution to the standard iPod docking station. Power/docking cable passes through stand and connects to the bottom of any iPod. the iJet Stand allows your iPod to rest safely when connected to your home stereo, or when being charged. The extra wide resting cradle allows power cable to be connected to any iPod while it is still in a protective skin. Your iPod power/docking cable passes through specially designed channel in base. No visible wires...Stand sits flat.  Separates into 3 sections for ease of storage and travel.  Sturdy and well balanced. 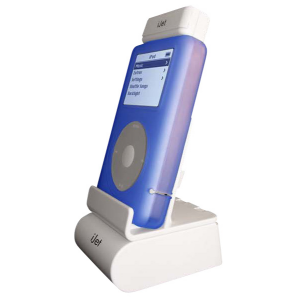 The stand is produced using a solid polycarbonate plastic that offers a safe resting location for your iPod and iPod mini.  Simple yet classic design. The iJet stand opens to reveal a storage compartment for your earbuds; while the iJet back plate provides a resting area for your iJet remote when not in use. iJet Skins let you match your iPod color, or mix it up to make a statement! These interchangeable skins let you add some style to your iPod world while still maintaining the iJet's unique ability to stay water-resistant. © 2003-2011 The iStore. All Rights Reserved.